Above is TYCO's uncataloged Wabash Cannonball Caboose. This odd TYCO piece was likely produced in the mid- to late-1970s. TYCO's Caboose model is listed throughout the "Brown Box" Era of 1971-1993 carrying the 327 stock number. Though rare in the TYCO number organization, this model is one case where two different items are represented by the same number. For example, TYCO produced a Chessie System example of the both the "Streamline Off-Center Cupola" and "Extended Vision Cupola" Caboose and BOTH models carry the same product number of 327-03. TYCO also did NOT always produced a roadname in both body styles. In fact, the Extended Vision Cupola Caboose enjoys a rather brief existence in a limited number of roadnames found mostly in the mid- to late-1970s. Also, there is no guarantee regarding the ability to match up a loco with a Caboose of the same roadname. For example, though TYCO did produce locos in Gulf Mobile & Ohio (2-8-0 Consolidation and GP-20) there is no known TYCO GM&O Caboose. This practice of not producing a matching caboose for a loco is typical of many model railroading manufacturers and not just a TYCO quirk. Though few TYCO Caboose models could be considered rare items, a couple examples are rather noteworthy. Apparently from the late 1970s, TYCO produced a Western Pacific Caboose that closely matches the scheme used for the 1979 Western Pacific GP-20 model. This Western Pacific Caboose is the "Steamlined Off-Center Cupola" style and was not listed among any TYCO catalogs. Even more odd, is TYCO's Wabash Cannonball Caboose. TYCO did not catalog any Wabash locos during the "Brown Box" Era. The "Steamlined Off-Center Cupola" Wabash Caboose appears to be of mid- to late-'70s vintage and shares the same paint scheme utilized for the "Midnight Special" line. 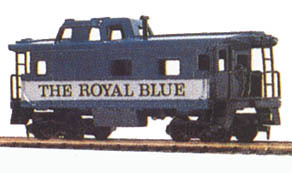 TYCO's "Midnight Special" Shark and Caboose used a paint scheme similar to one used by the Wabash for its early diesel locos. Whether this TYCO Wabash Cannonball Caboose is a prototype or was a regular production model is not known, however it must be considered among the most rare of TYCO pieces to surface among collectors. Both of TYCO's Caboose models have returned since the company left the HO-scale model train field in the early 1990s under IHC's name. 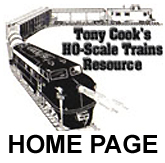 IHC (International Hobby Corp.) is the current owner of certain molds for trains and kits that were formerly in the TYCO product line. Collectors should note that IHC models do have some spotting differences from their TYCO counterparts. Generally, the IHC Caboose models will carry Yugoslovia or Slovenia markings on the underframe. To add some confusion, IHC did offer a red Chattanooga Caboose in recent years that many might mistake for a TYCO offering. Always check the underframe of any odd looking model, but remember that underframe are inter-changable too. Besides the IHC examples of the TYCO Caboose models, Pemco produced a clone of the Streamline Off-Center Cupola in the early 1980s. The Pemco examples are marked PEMCO Hong Kong on the underframe, but often and easily may be mistaken for a TYCO model. Another spotting feature of the Pemco Streamline Off-Center Cupola Caboose model is the white plastic window material. TYCO Caboose models do not feature window "glass" material, the Pemco Caboose did have a white plastic piece that sat inside the shell to provide windows for their example. Keep in mind the catalog appearances notes do not always represent the only years a specific model was available. 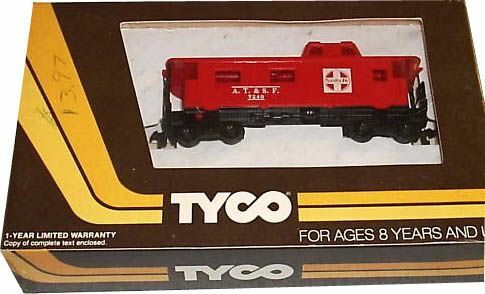 TYCO did always picture all rolling stock models in every year's catalog, so a model may have been available and simply not included in a catalog. The year's provided do represent when a Caboose appeared in a TYCO catalog and give a general timeframe for reference regarding availability. Though the shell does not go through any major changes during its life in the TYCO line, the end details do have some variations. Early examples of the Streamline Off-Center Cupola Caboose feature metal "U"-shaped railings on the ends. Later examples, beginning in the '70s, have all plastic railings. The two examples of TYCO Caboose models found here are the only ones offered during the "Brown Box Era" of the 1970s through 1993. As often is the case with TYCO, there is at least one exception to the above statement. The '80s Johnson Wax promotional train set included a red Johnson Wax Caboose that appears to be the same shell most familiar as a Life-Like offering. This Caboose is a center-cupola "New England" style model. In the '60s and before, TYCO did have a small 4-wheel Bobber Caboose. The TYCO Boom Tender that comes with the Crane features the shell for the Bobber Caboose. Also borrowing the Bobber Caboose shell is TYCO's Floodlight Car. Neither the Boom Tender, nor the Floodlight Car are represented here as both are found in catalogs as "Action Cars and Accessories" and not amongst rolling stock and never listed as just a "Caboose" model. Caboose offerings from the 1974-75 TYCO Catalog. The example carrying roadnumber 1654 is reported to have TYCO stock number 327-B on its box flap. Also found in Red Box packaging, the TYCO CB&Q-Burlington Route Caboose from the early '70s features the roadnumber 12568. TYCO's Burlington Northern Caboose is solid green in color with white lettering and carries the roadnumber 156. Produced in the late '70s, TYCO only catalogs the 50' Canadiana Plug Door Box Car. This Caboose may have been a Canadian market release and might not have been a regular catalog item in the U.S. It does not make any appearances in TYCO catalogs, but going by its letter-suffix stock number it would be an early 1970s item. This Caboose was a Streamline Off-Center Cupola model and was sold in Canada in the mid to late 1970s. This is the first Streamline Off-Center Cupola Caboose found in Chattanooga dress in the TYCO catalogs. The Caboose is solid red with white stripe and lettering and carries the number 607. 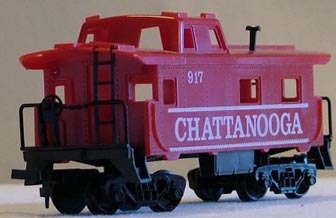 This is the second and most common of the TYCO Chattanooga Caboose models. It features the Streamline Off-Center Cupola style and is a yellow model with red mid section and white lettering. 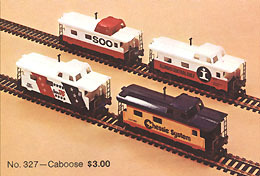 TYCO produced two Chessie System Caboose models. The above is the Steamline Cupola model; the other Chessie Caboose features the Wide Vision body. Arriving in 1979 with the introduction of the Clementine train set and steam engine is this matching caboose model. This D&H model is not found in TYCO's product catalogs. From the collection of a former vice president of TYCO, the pictured example above includes the notation that it is a sample. I have seen more than just this one, so it is not a one of a kind. 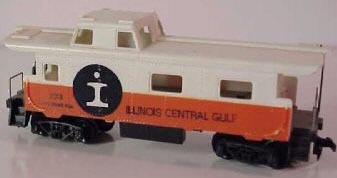 As seems to happen often to IC and ICG models, TYCO uses the "split-rail" Illinois Central logo, but letters the Caboose for ICG providing the model with an identity crisis of sorts. This is the first Illinois Central Gulf Caboose from TYCO, the next version featured the correct ICG logo. Above is the second TYCO ICG Caboose attempt. This time the correct ICG logo is found on the model. Lettering and paint match the first TYCO model. The third TYCO ICG Caboose features an orange roofline. Above is the third TYCO Illinois Central Gulf Caboose. 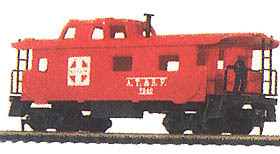 This ICG Caboose features an orange roof and the correct version of the ICG logo. This orange roof ICG Caboose arrives with the Steel Hauler train set of 1981. TYCO's Spirit of '76 Caboose included "SLSF 1776" on it side, perhaps making it a Frisco (St. Louis-San Francisco Railway) model. TYCO also produced identical examples carrying FEC (Florida East Coast) reporting marks. 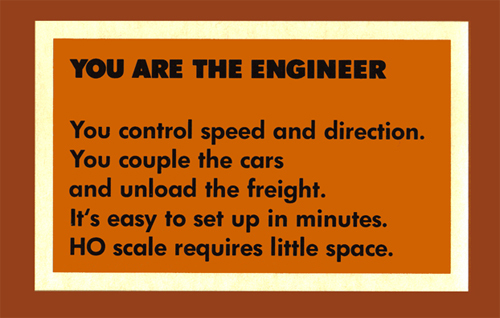 Also available in the 1960s and found in TYCO's "Red Box" packaging is the Union Pacific Caboose. The letter-suffix stock number is "327H" for this model. The UP Caboose is solid yellow with red lettering and the model carries the roadnumber 1654. Found in some train sets featuring the Virginian Century 430 from the early '80s, this Streamline Cupola Caboose is not featured among rolling stock selections in TYCO's catalogs. Above is another odd example in the TYCO Caboose line, a Western Pacific model mostly likely from the same period as the WP GP20 diesel in the late '70s. This piece is never found in TYCO's catalogs. This model has no known TYCO catalog appearances, it may be a prototype model and not an actual regular production run release. Just when was that famous TYCO Caboose first released? 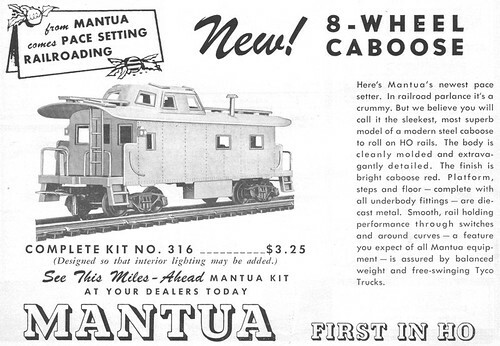 Above is a December 1955 Mantua ad promoting the then-new Caboose. As detailed above, PEMCO produced a clone of the TYCO Streamline Off-Center Cupola Caboose model in the early 1980s. Above is the Santa Fe example of the PEMCO Caboose, additionally this model was available in Union Pacific, Burlington Northern, and Amtrak dress. For more information and images of the PEMCO Caboose, click on the image of the Santa Fe PEMCO Caboose and a new browser window will open with details and pictures of the PEMCO product. This Chattanooga Caboose is found in late examples of the Chattanooga Choo-Choo train set (No.7425) from around 1990. This Caboose looks very similar to TYCO's earlier Hong Kong produced model, but this example was made in Yugoslovia. IHC has offered this Caboose in its own line since TYCO's departure from trains after 1993. IHC has also made newer runs of the Extended Vision Cupola Caboose in recent years that match the former TYCO model.